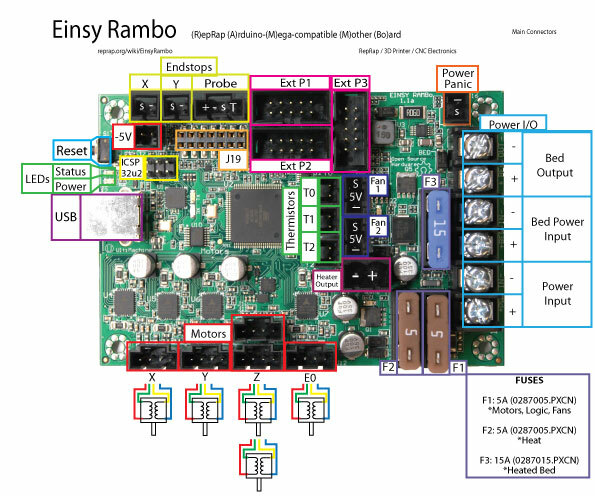 I am using an Einsy Rambo in my current build, running at 12V (in retrospect it sounds like that was a mistake based on other posts but too late now). Sensorless homing works but is being problematic to tune and seems to behave differently depending on how how much power is being drawn for other things (e.g., heaters). That might also be the NEMA 14 motors. That's a topic for another post however. While I was hoping to get away with sensorless homing I'm at the point where I just want to get printing again so I am thinking of installing endstops. The design I am building uses hall sensors which require a 5v supply. The new connectors on the Einsy for the X and Y endstops no longer provide 5V rather just the Signal and Ground. I note the 5V output near the endstop connectors, I suspect it's proximity is so people requiring 5V to power endstops can still use it if needed. So question is can I use this to power both endstops and if so which ground should I connect (if it matters) to the endstops. Since incorrect wiring on endstop has some pretty serious consequences I'd rather not experiment so any ideas on the best wiring configuration would be appreciated. I may revisit the sensorless homing, at least there is nothing to prevent this even if the endstops are installed. So answering my own post here. Spoke with UltiMachine and they confirmed that just using the +5V near the endstop connectors for both sensors would be find. So I have both sensors tied to the +5V and then the Signal and Ground for each endstop connected to the endstop terminals. This is working fine.